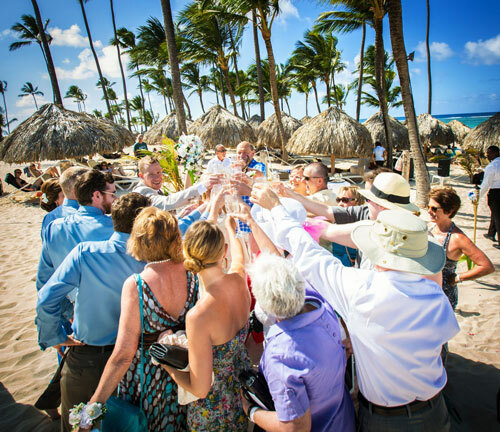 You've decided on a destination wedding in a romantic location, somewhere tropical, with amazing beaches, sunsets, and mai-tais; an all-inclusive resort perhaps where the helpful wedding planner will handle everything for you, including the photography. Well, I'm here to suggest foregoing that option and instead, hire a photographer from home and bring them with you.Why? Because resort photography packages can be a hit or miss experience; with so much at stake, do you really want to chance it? All resorts are not created equal and the concerns I've listed below may not be an issue at your particular resort. However, it helps to be aware of the potential pitfalls. In a nutshell, here's why you may want to bring a photographer with you. Often the abilities of the resort package photographer are unknown, or worse, woefully misleading. It is possible that they may not be more than an hourly service worker with a fancy camera. You may not even know their names until your wedding day, let alone their qualifications. Sadly, it does happen that some resort photographers are less then scrupulous in the portfolio of images they advertise. The super-glossy, stylistic images you've seen on the resort website are sometimes nothing more than teasers; images made by professional photographers who may not even work for the company you've hired! Local wedding photographers are small business owners, whose level of transparency and approachability are their greatest strengths. You can much more readily assess their level of training and experience with a simple perusal of their web site, or quick read of their reviews. Search on the web for "wedding photographer" and you will find hundreds of different professionals with hundreds of different styles: fashion, journalistic, documentary, black/white, panoramic, postmodern-interpretive, etc. It's definitely not a one size fits all. Savvy brides and grooms take the time to pre-select the type of images they prefer, rather than leave it to fate. The photographer you select and hire will ensure that you get what you want. With having chosen a local photographer to accompany you on your trip, you will have already established a level of accountability and quality. You will have signed a contract, based on a familiar legal system, with the professional terms and conditions set.Further, when you return from your fabulous wedding vacation, the beach, the coconut drinks and majestic resort will be far, far, far in the distance, but the photographer you brought will be right in your backyard. Your precious images are much likelier to be completed and handed over in a timely manner. The photographer is more likely to be immediately responsive to any questions, concerns or editorial requests you may have. One bad review from a bride and groom can cripple business for a local photographer, while a package-provided resort wedding planner and photographer may shrug it off and move on to the next 20 weddings they have for that weekend. To put it simply, you will get much more from the photographer you bring with you; both in terms of coverage, commitment and product.Because your photographer has travelled the long distance with you she/he is more willing and able to shoot all facets of the experience: rehearsal dinner, getting ready, the ceremony, the reception, dancing, portraits, trash the dress, etc. While a resort photographer may be willing to take on these added duties, be prepared for a large increase in cost. Which brings me to the next point. With your own photographer, all costs will have been pre-determined and budgeted prior to stepping on the plane. The potential of having your album held up at the border until you pay exorbitant custom duties; or seeing that the resort has added an extra $500 to your bill because your photographer stayed an extra 30 minutes is no fun at all.When it comes to destination weddings, no surprise costs = peace of mind. The benefit of hiring a photographer from home is that you can meet in person on multiple occasions to plan your event and establish a rapport. You'll be spending a lot of time with the person hired to memorialize the event, and being comfortable with her/him greatly impacts the experience as well as the quality of the images. It also makes ordering albums and prints after the wedding far more convenient.Let's face it, all-inclusive resorts are run and managed by multinational corporations. They are big, profit seeking businesses who, while providing an excellent experience for their clientele, might lack the personal touch, or rather have a "conveyor-belt" like mentality towards their guests. Rest assured that the photographer you bring with you from home will be just as excited as you are to be in the exotic locale. Doubtless, she/he will be working her/his tail off to prove you've made the right choice. And frankly, IMHO, you will indeed have made the right choice.